Every year more than 795,000 Americans have a stroke. Of this number, 25 to 40 percent acquire aphasia. 2.4-4.1 million people are currently living with aphasia in North America. Most people don’t know they have it or even how to explain it. 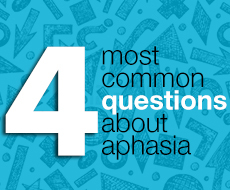 With more than 30 years of experience serving the aphasia community, we’re answering some of the most common questions we're asked about aphasia. Aphasia is a communication disorder that affects a person's ability to process and use language. It is a neurological condition caused by damage to the portions of the brain responsible for language, and it does not affect intelligence. In fact, many people with aphasia want others to know that they are not drunk or stupid! Are there different types of aphasia? There are six types of aphasia. The type and severity of aphasia depends on the precise location and extent of the damaged brain tissue. Aphasia can range from mild – where a task like retrieving the names of objects is difficult – to severe – where any type of communication is almost impossible. What does aphasia feel like? Many individuals with aphasia report that it’s like having a word on the tip of your tongue. It can be frustrating and challenging to explain thoughts or feelings. Individuals with aphasia have difficulty using language to communicate what they know. In many instances, their thought processes are fine, but they can't say what they are thinking. Can you get better from aphasia? The outcome of aphasia is difficult to predict, given the variability of its symptoms and types. Generally, if you are younger or have less-extensive brain damage, your chances for improvement and recovery are better. Many people with aphasia can recover within a few months, but up to 60 percent still have language impairments more than six months after a stroke. The location of the injury is another clue to prognosis. In general, people with aphasia tend to recover skills in understanding language more completely than skills involving speaking and writing. Recovery starts with lots of practice reading, writing, and speaking. Learn quick facts and figures about aphasia, as well as what resources are available to you by downloading our Aphasia Journey eBook!